The DIC-3 hand held anemometer features Maximum's unique folding 3-cup design. Cups collapse for easy storage, and the instrument comes with a custom carrying case. To determine wind speed simply open the folded cups and hold the instrument in a wind current. Unlike fan type hand held anemometers that must be aimed precisely into the wind, our wind tunnel tested accuracy is not affected by its position. 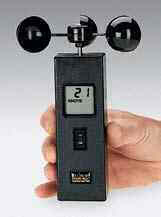 Wind direction is variable and this instrument records accurately from any direction. DIC-3 has four selectable scales: MPH, Knots, km/h or m/s, to be shown on the 2-digit LCD screen. A single 9V battery (included) powers the LCD for up to 70 hours of continuous use. DIC-3 provides readings up to 155 MPH in one of four modes: instantaneous velocity, highest gust since reset, 2-minute or 5-minute wind speed average. Cup rotor is 5.88" in diameter when extended.